The National Investigation Agency (NIA) on Thursday raided the residence of senior separatist leader and Shia cleric, Syed Agha Hassan in Jammu and Kashmir’s Badgam district. Sources said the NIA sleuths assisted by the police and Central Reserve Police Force (CRPF) raided Hassan’s home and carried out searches. 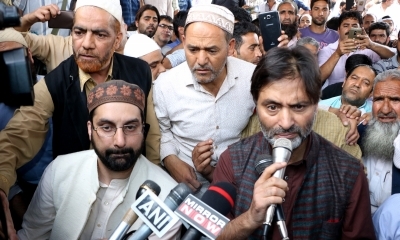 Three senior separatist leaders, Syed Ali Shah Geelani, Mirwaiz Umer Farooq and Yasin Malik have announced they would takeout a protest march to the NIA headquarters in New Delhi and court arrest on September 9.